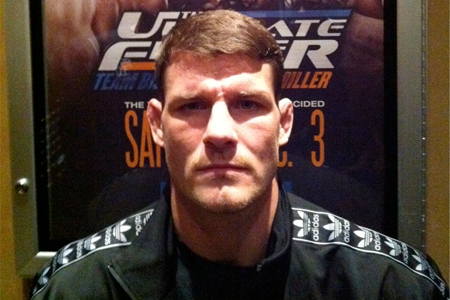 With Saturday’s controversial unanimous decision win over Michael Bisping (Pictured), Chael Sonnen cemented his next dibs status. However, Uncle Chael is still positively convinced there is no way middleweight king Anderson Silva will come out of what Sonnen has called “retirement” to defend his crown against him again. “I know I’ll do my part,” Sonnen said of agreeing to a rematch. “Do I think he will sign to fight? No, I don’t. But we’ll see. I’ve been wrong before, but I’ve tried to get him to fight four times. That’s the one thing they don’t tell you, and I’m not trying to go against the brass here, but that’s the one thing they haven’t revealed. They’ve offered him the fight four times, and he said no four times. Mysteriously he’s supposed to accept on the fifth? “I’d rather talk about real men like Michael Bisping who step in on 10 days notice and fights me,” Sonnen stated. “Those are the types of guys I’d rather give attention to, not some bum in Brazil.